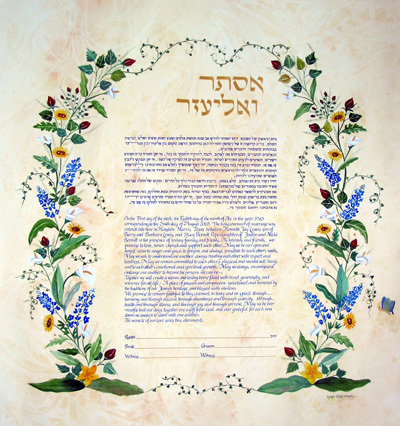 This oval-shaped delicate illuminated Interfaith Ketubah (other Ketubah texts available) is created on the artist-decorated "parchment" paper. The blue text is surrounded by colourful Bluebonnets, Rose buds, Calla Lilies, and Sunflowers. The Bride and Groom's Hebrew names are written in gold paint.